South Coast Beaches Maine Inns – Another great reason to visit Maine. South Coastal Maine has a fabulous selection of Inns, and Bed and Breakfast Inns to accommodate every budget and lifestyle. Southern Maine Beaches are hugely popular during the summer months. Southern Maine oceanside inns have been a retreat for decades. Let us introduce you to the finest inns and bnb lodging in Maine. Choose from oceanside inns, country inns, elegant B&Bs and chef-owned inns. Share southern Maine Inn comments or questions. 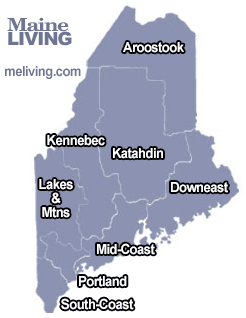 Thanks for mentioning to the innkeeper(s) “I found you online in meliving.com – Maine’s Internet Magazine“. To feature your Maine Bed & Breakfast Inn, contact us. If you are searching for an historic inn with affordable class and fabulous food in southern coastal Maine - The Kennebunk Inn is the place. Beautiful beaches, nature preserves, museums, galleries, antique shops, and more. We look forward to sharing our special place in the land of the pointed firs. Experience quintessential New England charm at the Captain Lord Mansion. Your personal comfort & intimacy are assured by the Mansion’s large, beautifully-appointed guest rooms. Luxurious amenities include oversize 4-poster beds, cozy gas fireplaces, heated marble bath floors, body-jet showers & many double whirlpools. Serenity & convenience are vitally important today. Serenity is found in the Inn's quiet residential neighborhood. Convenience is found in the Inn's picturesque, convenient, location from which to walk to explore the shops and galleries of historic Kennebunkport. Discover Maine Bed & Breakfast Inn accommodations by region. Aroostook, Downeast, Katahdin, Kennebec, Lakes, Mid-Coast, Portland and South-Coast.